Mozzarella Stuffed Meatballs are the perfect individual appetizer, tasty and flavorful, and are so easy to make. Perfect for a party platter, this simple yet cheesy meatball is baked, ready to serve, and can be altered for keto friendly diets. It’s that time of the year again where every relative you have descends in to you house and they ALL like different things. One cousin wants veggies only, one swore off pork, and at least 10 of them are on a variation of keto-low carb-carb cycling. Make sure you look at the notes on the breadcrumbs! Unfortunately its an impossible to please every taste bud in the house (trust me, I have 2 kids, they are rarely please) but these mozzarella stuffed meatballs put out a good effort. I mean who doesn’t love a combination of beef and sausage, tolled up in a bite sized treat with a melted oozy cheese on the inside? And because these mozzarella stuffed meatballs can be thrown into the oven and baked, you don’t have to stand over them while they cook up. Btw, I am always a fan of fresh herbs when given the option! NOTE: Bread crumbs are not notoriously low carb however if you eat a low carb diet, Panko is typically the way to go for a lower carb option. If you want to completely eliminate bread crumbs, its fine to do so and you wont need as much egg to stick the meatball together. There are also quite a few different options for Keto friendly breadcrumbs and Amazon is full of available substitution products. Personally the carbs are so minimal, I don’t worry. Here is this mozzarella stuffed meatballs recipe official carb count per meatball via CarbManager. Cut up a mozzarella cheese stick and stuff on the inside instead of shredded cheese! Baked mozzarella stuffed meatballs are absolutely a perfect appetizer! But they also double for the top of your spaghetti or in a meatball sandwich! Once you have them made, you can easily get creative with your recipe menu. 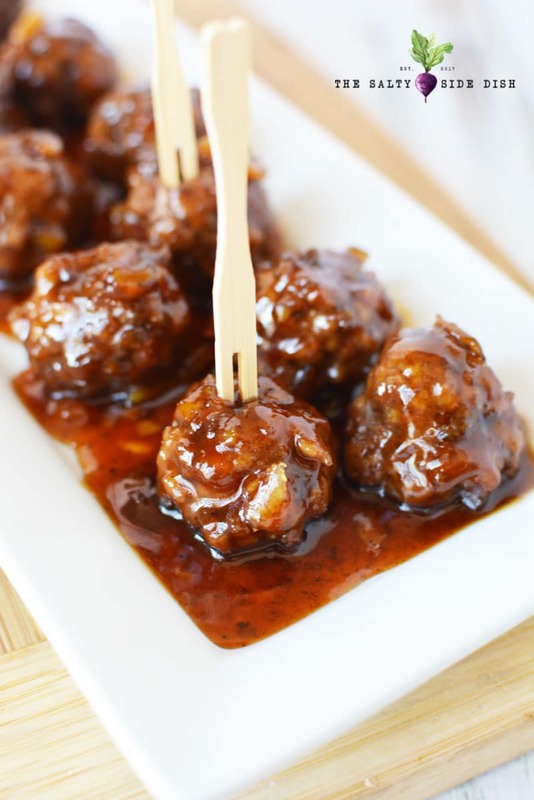 Also do not forget to try these cocktail meatballs, a totally different flavor! 2. Combine ground beef, sausage, breadcrumbs, egg, parsley, basil, oregano, garlic powder, pepper, and salt in a large bowl. Using your hands, mix together ingredients until well combined. 3. Scoop meat mixture by the tablespoon and form into small disks. 4. Add a pinch of shredded mozzarella cheese to each disk. 5. To form a ball, pinch the ends of each disk together to seal in the cheese, then roll the disk in your hand to shape a ball. 6. Place the meatballs in a greased baking dish and bake for 25 minutes or until the meatballs are cooked through. Mozzarella Stuffed Meatballs are the perfect individual appetizer, tasty and flavorful, and are so easy to make. Perfect for a party platter, this simple yet cheesy meatball is baked, ready to serve, and keto friendly. Combine ground beef, sausage, breadcrumbs, egg, parsley, basil, oregano, garlic powder, pepper, and salt in a large bowl. Using your hands, mix together ingredients until well combined. Scoop meat mixture by the tablespoon and form into small disks. Add a pinch of shredded mozzarella cheese to each disk. To form a ball, pinch the ends of each disk together to seal in the cheese, then roll the disk in your hand to shape a ball. Place the meatballs in a greased baking dish and bake for 25 minutes or until the meatballs are cooked through.